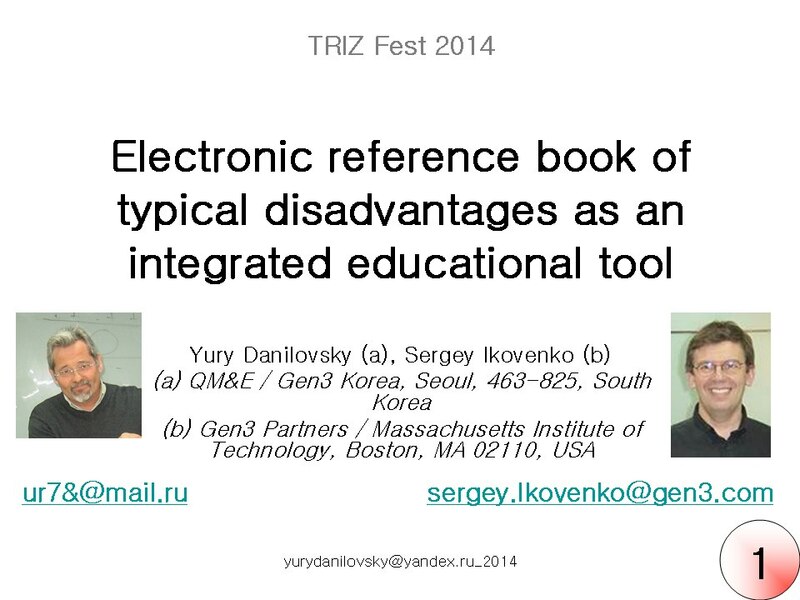 A new educational tool is suggested to facilitate the practical use of classical TRIZ tools by students. The instrument is based on the concept of typical disadvantages and their relation to physical contradictions in engineering systems. We consider the disadvantage as a shortened form of formulation of physical contradiction. Thus, all disadvantages are grouped into 5 categories depending on the kind of critical resource: Substance, Field, Time, Space, and Function. Totally we separate 30 typical disadvantages. For each of them, we found the most typical inventive principles, standards and trends that are frequently used for overcoming this type of disadvantages. They were found by analyzing the data about 5000 known inventions that were realized in the market. The new tool is available as an electronic reference book where each typical disadvantage is linked to corresponding principles, standards and trends. For each of these links, practical examples are suggested. Experience of practical use of the suggested instrument in our educational courses has demonstrated high effectiveness: the students better realize the studied TRIZ tools (trends, principles, standards), faster find the solution, and resolve greater percent of problems. Keywords: TRIZ, education, disadvantage, principle, trend, standard solution. All main instruments of classical TRIZ (inventive principles, standard solutions, ideal final result, trends of engineering systems evolution, ARIZ) are based on general concept of contradiction in a Technical System (TS). TRIZ operates with several kinds of contradictions; among them, the most usable are Technical Contradiction (TC) that describes undesirable consequences of improving TS (if we do something with the system then we improve A but inevitably worsen B), and Physical Contradiction (PC) that describes opposite requirements to the same parameter of TS (the value of parameter P should simultaneously be big to achieve desirable result C and small to achieve desirable result D). In this paper we present the new educational instrument that integrates Physical Contradictions with the instruments of classical TRIZ. When performing educational courses in different countries we face the same problem: it is difficult for students to realize the concept of “contradiction” and “to think In terms of contradictions”. Such way of thinking requires much time and efforts from both students and teachers (trainers, coaches, facilitators), especially if they belong to different cultures. On the other hand, today reality of TRIZ education requires obtaining the first practical results “right now”, maximum, in the end of the first training day: otherwise, typical customers consider TRIZ “too much complicated”, “not friendly”, “ineffective”, etc. As a result, students have insufficient motivation to TRIZ-education, which complicates obtaining new skills and knowledge and considerably decreases the efficiency of such education in general. The problem can be formulated as a contradiction: starting TRIZ-education should take short time to save the motivation of students to learning TRIZ, and it should take long time to realize the general concept of contradiction as a base of all instruments of classical TRIZ. Here we try to improve this situation. The problem of long “learning curve” is not new in TRIZ. The founder of TRIZ Genrich Altshuller made much effort to make basic TRIZ education faster and more efficient. One of the first attempts in this direction caused the development of the worldwide-known Contradiction Matrix [1, 2]. The author analyzed many descriptions of the inventions and suggested the most popular inventive principles that were used to resolve technical contradictions with the same type of conflicting parameters. This instrument was then criticized many times (mostly, on the sidelines) for low practical efficiency, but up to now it remains one of the most popular TRIZ instruments available for beginners. A new version of this instrument was suggested in  where the list of conflicting parameters was extended for total 50 items. Other classical tool that was developed with the same goal (to shorten the “learning curve”) was a set of standard solutions [4, 5]. The idea of this instrument was to simplify the use of rather complicated instrument, ARIZ, for the most typical problems that often have similar solutions. This tool also includes a classification based on Substance-Field modeling. Standard Solutions and Inventive Principles are internally connected with each other. In , their relationship is described and tabulated: for each of inventive principles, the authors specified one or more standard solutions that use this principle. Essentially, the mapping table suggested in  can be considered as a new classification of standard solutions. Similar solution was suggested by Fedosov  to simplify teaching the concept of function: the author compiled a “handbook of elementary functions” that covered the majority of practical situation requiring functional analysis. Then, a rather complicated and error-prone procedure of formulation of particular functions was replaced for selection of proper function from the list. Similar idea was suggested in . (4) For each class of the suggested classification, specify one or more typical (popular, frequently used) instruments that effectively work with this class of problems. In this paper, we apply the same general strategy to physical contradictions. Logics of all known versions of inventive algorithms (ARIZ-85, ARIZ-CMBA, AVIZ, etc.) is essentially very similar. All of them start from the description and definition of some “inventive situation” in terms of some or other inconvenience in the prototype, unsatisfactory complexity of performing the function, too high cost, etc. All of these issues characterize disadvantage (DA) of the existing system as the first, basic category to be analyzed. Then we convert the description into the “language” of parameters and build a TC for understanding of the causal link of this DA. Afterwards, we built a model of PC as a new heuristic single-parameter model where the DA is considered in the form “a parameter P should be big (for something) and small (for something else)”. Then we build the next heuristic model of the DA on the base of concept of Ideal Final Result (IFR), with two key phrases: (1) my new system contains some “X-element” that causes disappearing the DA, and (2) the new system prevents the DA itself, without special intervention. The solution of this “equation system” (finding a common solution for all of these models) helps a solver to focus his/her thinking to search for a solution as some image, “portrait” of possible solution. In this paper, we use the term “disadvantage” as a synonym of “undesirable effect”. With the term “disadvantage” we underline the practical focus of TRIZ instruments: to get a competitive advantage, to make a new or improved system better than its previous variant; in other words, to suggest something that satisfies objective requirements to a system, not somebody’s desires. As follows from the above reasoning, the DA is a key category in the process of the development of a new TS, as far as the concept of DA is used in some or other way in all instruments of classical TRIZ: in TC, PC, IFR, standard solutions. Basing on this general understanding, we suggest a rather simple classification of the most “popular” typical DA that force a solver to find a new inventive solution of a problem. We have to notify that G. Altshuller tried to do something very similar in the Appendix 1 to ARIZ-85C [9, 10] where he described 11 typical models of conflicts. Unfortunately, our experience shows that practical use of this classification in TRIZ education is rather difficult: the students very often confuse different kinds of conflicts, improperly determine their “sides”, and, as a result, just “draw a picture” instead of understanding the nature of the conflict. We see the probable reason of this difficulty in inconvenient language of description that is based on the term “conflict”. Much more convenient and habitual language uses no “conflict” but “parameter”. For example, it is very easy to describe the disadvantage of a pencil in the form: “long use of a pencil causes pain in fingers of an arm that holds it”. After some analysis, we could formulate a TC that connects the time of use with some characteristics of the pencil itself, i.e. its hardness, and then move to a PC where this second parameter (hardness) would be used: “hardness of pencil should be big to save the shape of pencil and small to avoid causing the pain in fingers”. Certainly, operating with the parameter “hardness” simplifies the search for a proper solution. However, to come to this “secondary” parameter we need considerable time and effort. At the same time, if we come back to the source formulation we can see that it already contains some parameter: time of use. In fact, we can rewrite this formulation in the form of PC: “time of use should be big (to write the required text or draw picture) and small (to prevent the pain in fingers)”. The experienced TRIZ specialists often call such PC-like formulas derived from the source problem formulation as “proto-PC” or “initial PC”. The general recommendation is not to try to resolve this “proto-PC”, as far as the information about the problem is often insufficient, and continue the analysis to formulate the “proper PC” (in our case, concerning the hardness of pencil). The same recommendation can be derived from the text of ARIZ  where the initial formulation should be transformed to a TC and only afterwards to a PC. Reasoning about “erroneous” intension to resolve PC without formulating TC can be found, for example, in  where the author underlines limited application of such simplified approaches. We completely agree with the last statement and consider only the situation of basic TRIZ education within very limited time (1-2 working days for the course), as far as such time limit was specified by very many our customers. Analysis of about 5000 inventions realized in the commercially successful products showed some essential relationships between the kinds of parameter mentioned in a “proto-PC” and particular TRIZ instruments (principles, trends, standard solutions) that typically allow resolving the problem. For example, the problem of expendable substances (that can be rewritten in a “parametric language” as “too high consumption of substance”) is very often solved by using the trend “transfer to Supersystem”: pen transforms to computer (eliminating the ink), oven transforms to electric cooker (eliminating the fuel), etc. In other words, problems with similar disadvantages often have similar solutions. Note that similar idea is indirectly used in the Functional Oriented Search (see e.g. ): if a problem is properly formulated in the “language of parameters” then (after translation to the “language of functions”) it is possible to find a solution in some far enough domain area and use its operation principle to improve the source system. In other words, there is a rather high probability to find similar (working!) solutions for systems with similar disadvantages initially formulated in terms of the same parameters. In the present paper, we suggest a new instrument that integrates significant parts of our knowledge about DA and their connection with the instruments of classical TRIZ. As it was stated above, to practically use the idea of “similarity by disadvantage”, especially in basic TRIZ education, we need some simple and convenient classification; in our case – the classification of disadvantages. Earlier , we suggested a new classification of disadvantages basing on the use of five general categories that are widely used in TRIZ: time, space, field (energy), substance, and function. This classification contained 36 typical DA. However, our experience in TRIZ consulting and education shows that six of them have never appeared in our projects (we tried to apply this approach backdating to several hundred previous projects). Thus, we excluded these six types of DA from our classification to reduce the “information noise”. The suggested classification is presented in Appendix 1. This classification was derived empirically and, therefore, does not pretend to be complete. However, it covers an overwhelming majority of real-world problems that we resolved last time. In Appendix 2 we summarize the results of our analysis of 5000 inventions realized in commercially successful products. The table describes the instruments that get the tips how to come to these solutions from previous state of the system. Like other tools of this kind, the suggested mapping does not pretend to be complete but suggests the recommended tools. The names and descriptions of inventive principles and standard solutions are omitted to save space. The suggested map of disadvantage overcoming tools was used in numerous educational courses and showed positive results. Our students were able to attribute particular problems to one or few of 30 typical DA after about just an hour of study. The use of the suggested principles and trends was available to beginners, right after learning corresponding tools. Standard solutions appeared not as easy in use, but in the basic (1-2 days) educational courses we did not even try to use them, as far as this instrument requires high enough qualification of a solver. Let us present only one practical example of students’ work. The task was formulated as “to suggest idea of shoes easy to put on and off”. The students attributed the disadvantage of the prototype system to the type 10 “High energy consumption when preparing to use”. By using the instruments recommended for this type of DA they suggested several ideas, two of them are presented in Fig. 1. We have to note that, although this instrument was planned to use only in educational projects, in fact we also used it in our own projects as an auxiliary instrument. In Fig. 2, one example is presented. 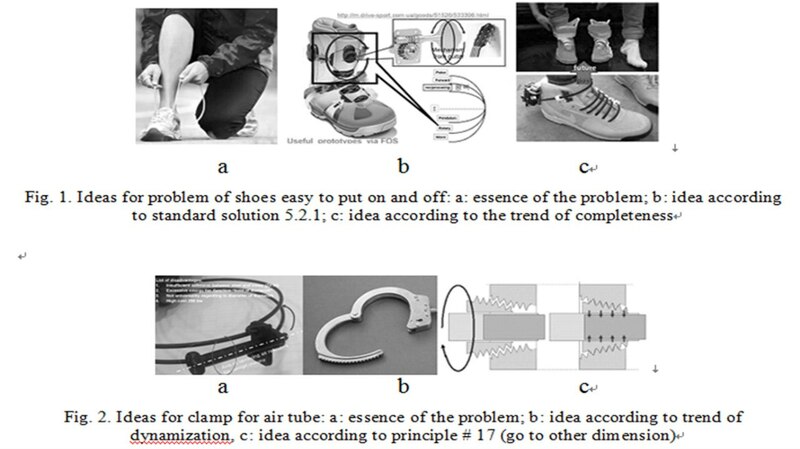 The problem was to suggest a new concept for the clamp for air tube. Key disadvantage was determined as “High energy consumption when preparing to use” (# 10). Our preliminary analysis according to Appendix 2 allowed us to suggest several ideas that were suggested to the customer in our final report. Thus, we think that the suggested approach may be useful not only in educational projects for beginners but also for professionals in the stage of preliminary search for simplest solutions. The need to accelerate educational courses forced us to find new approaches to old problems of TRIZ education, one of them being the necessity to quickly teach the student to operate with the basic concept of contradiction in general and physical contradiction in particular. Our previous experience showed that the students, especially belonging to different (e.g. Asian) cultures, faced serious difficulties in understanding what these “contradictions” mean. This difficulty caused some frustration that appeared as perception of TRIZ as something “difficult” and “inconvenient”, “not user-friendly”, etc. The suggested instrument was developed to facilitate the basic TRIZ education, make it easier and faster and, therefore, save motivation of students to learn TRIZ. We found long time ago that, although the students have serious problems with formulation of contradictions, they usually have no difficulties with formulation of disadvantages of the system to improve. Thinking in terms of competitive disadvantages as undesirable values of some parameters of a system was natural for most of them and did not require special learning. When developing the instrument, we tried to use this basic ability of our students to facilitate TRIZ education. The instrument is based on general assumptions that was made long time ago, namely – the assumption that similar problems often have similar solutions. As a criterion of “similarity”, we used the type of disadvantage specified in the original description of inventive situation. For that, we suggested a new classification of disadvantages. Our classification groups known disadvantages into 30 types in 5 general categories widely used in TRIZ: time, space, substance, field, and function. For each of these 30 types, we found the most applicable tools that provide a solver with working tips. For that, we analyzed about 5000 inventions that were realized in commercially successful products. Finally, we obtained a “map” that links typical disadvantages to classical TRIZ tool. This “map” was compiled in the form of electronic reference book. During the last period, we tried to apply the suggested method in our educational courses and got positive results. Our students got the basic practical skills faster, found more ideas of solutions, better realized the sense of the learned TRIZ tools. As a “side effect”, the suggested method became effective in our own projects as well: it allowed saving some time when searching for the simplest solutions. An example of such solution is described above. We believe that the suggested approach facilitates learning the classical TRIZ tools (trends, principles, standard solutions) and allows better understanding of basic concepts of TRIZ. 1. G.S.Altshuller. The algorithm of invention: Moscow, Moskovsky Rabochy, 1973, Appendix 1 (in Russian). 2. G. Altshuller, The Innovation Algorithm, TRIZ, systematic innovation and technical creativity, Worcester, MA: Technical Innovation Center, 1999. 3. D. L. Mann, "Comparing the Classical and New Contradiction Matrix Part 2- Zooming In", The Triz Journal, 2004. 7. Yu. Fedosov. Statistics of “elementary functions”. TRIZ Summit, 2009. 8. Kynin A., Priven A. Formulation of functions of an engineering systems with the matrix of generalized parameters // Proc. Int. Conf. 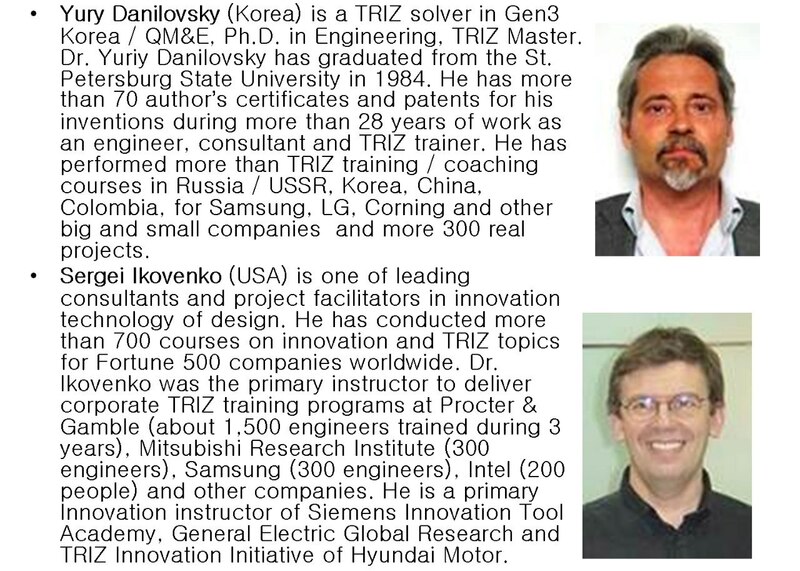 “TRIZfest-2013”, Kyiv, Ukraine, August 1-3, 2013. – MATRIZ, St. Petersburg Polytechnic University publishing house, 2013, p. 59-67. 2,3,4,7, 15, 19, 23, 28.